Christ the King! Have you ever tried searching for an image of Christ the King? It is interesting what comes up when you do. Often the first images are of a somber white man with a distant look in his eyes, an awkward crown on his head and who is not approachable. The other option is the super hero version; the tough looking dude with no ordinary crown but a crown of thorns who swoops in to save the day or make you pay but still not approachable. Neither really speaks to me as both seem to miss the point of who Christ the King is truly. Maybe it is because as a child (and maybe even still a bit now) I was fascinated with kingdoms and kings and queens and princes and princesses. And although the kings and queens in my fantasies did where crowns they were not awkward and it did not stop them from being present with the people and knowing their people and creating a kingdom where all were indeed welcome. This seems more like the image of Christ the King we are called to celebrate and one I crave to know more and more. The whole mission of Christ is to usher in, establish and build God’s kingdom. The kingdom of God which Christ is king of is built upon justice, mercy and a love greater than our understanding. It is built upon relationship, dignity and beauty. It is built upon hope, truth and life, so one can see why an awkward crown or a super hero doesn’t seem to fit this mission. When I picture Christ the King, I see a man with passion and love in his eyes, with a depth about him that is warm and inviting. I see a man who desires to know you and is willing to walk with you through the struggles and in the joy. 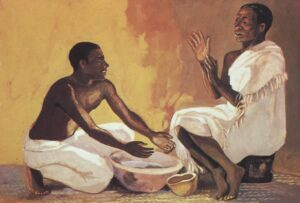 I see a man who is willing to wash feet, carry the burden and not count the cost. When I picture Christ the King I see the man who called forth ordinary people to roles of service. I see the man who was not afraid to draw near to a leper or respect those who were different. I see a man who loved dearly and gathered those he loved and really anyone to share with them a story so they could come to understand God’s kingdom. I see the man who loved the widow, the child, the poor. I see the man who was heartbroken at his friend’s death, who listened to the pleas of a heartbroken mother and hurting father. I see the man who saw the bigger picture and expressed it in beatitudes and a golden rule. I see the man who taught about and lived prayer. I see the man who washed his disciple’s feet, forgave his betrayer and opened up the kingdom doors of freedom for all people. I see the man who knows the great gift of faith, hope and love. I see the man who is Christ the King and how he makes me part of God’s kingdom. I see Christ the King and crave nothing more than to walk with him. when in times of reflection. You are in my deepest self. I crave you. I crave you. I crave you. when in the present moment. In Your Promise of life. I crave you Christ my King.